A software platform that eliminates inefficient paper processes and streamlines workflows within your business. The award-winning GlobalSearch® software enables organizations to manage business more efficiently by taking document processes digital. This simplifies the capture, retrieval and distribution of your most important business information. GlobalSearch is perfect for organizations of any size, offering flexible pricing and configuration, with the ability to select the tools you need for your specific business applications, from simple task automation to enterprise-class functionality. GlobalSearch is easy to use, learn and support. Having a similar look and feel to the Microsoft OfficeTM interface, GlobalSearch is simple to navigate and completely customizable to fit your specific business needs. You decide the path of your documents. GlobalSearch electronically manages anything from scanned papers to digital files, such as PDF, JPG, TIF, WordTM, ExcelTM, and OutlookTM. GlobalSearch includes a fully integrated scanning module, with automation capabilities, multifaceted searching and granular user-based security for worry-free storage. GlobalSearch functions on a wide variety of platforms and operating systems. Whether iOS or Android, laptop, tablet or smartphone, users can get to their work and contribute remotely. Even within the web, GlobalSearch delivers the speed of a desktop browser and keeps your content secure. Extend the reach of document management software beyond the confines of your desktop. Delivering anywhere, anytime access to documents from any mobile device, GlobalSearch® keeps processes consistent and your team productive, while offering the same power and capabilities as the desktop client. Automate the capture and storage of your business critical information. GlobalCapture® is the unique document processing solution that brings together all data capture points into a single, easy to use platform. Eliminating the need for manual intervention, GlobalCapture uses intelligent batch separation, image cleanup, optical character recognition and barcode recognition to automatically detect and extract information. Accelerate document routing and review. GlobalAction® is the next generation solution for document workflow automation. This Business Process Management (BPM) engine provides the ability to map document processes on a drag & drop design canvas, automating actions while gaining visibility into productivity. From automated email notifications to timed event triggers, GlobalAction keeps business moving throughout the entire lifecycle of a document. 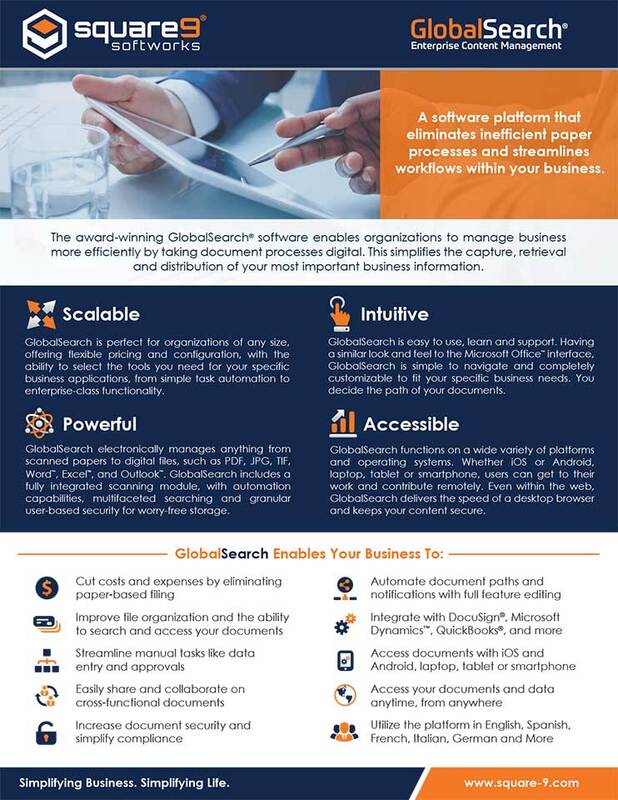 GlobalSearch integrates with the leading business application programs including QuickBooks®, DropBox®, Salesforce®, Microsoft DynamicsTM and more. In addition, you can gain full capture-and-retrieval support right from the control panel of your office multi-functional printer, which acts as the catalyst for workflow automation. Granular security in GlobalSearch provides user-based sign-in access, keeping databases, Archives, documents and feature-level security enforced. The built-in audit trail ensures your security is working by logging all document actions by date and user, providing full visibility into business output. From small business applications to enterprise solutions, GlobalSearch goes to work for you, bringing your business to new levels of efficiency!